Department of Agricultural Extension Education & Communication, The University of Agriculture, Peshawar, 25130, Khyber Pakhtunkhwa, Pakistan. Small Research Grant Program Under NDP, WAPDA. 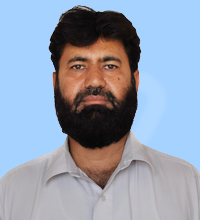 Adaptive Research Project for major crops in Bannu District under ARP-II. An Investigation into professional competencies of extension agents of Khyber Pakhtunkhwa under AUP-HEC Project. Quantification of economic gain from chickpea crop sown under irrigated fields in southern Khyber Pakhtunkhwa and its implications for agricultural extension under PSF Islamabad. M.S. Scholarship in Agricultural Education from TIPAN (USAID) for 1992-94. Small Research Grant for Ph.D. by National Drainage Program (NDP) Lahore. Have supervised one PhD student for his thesis/dissertation as major supervisor. Have supervised about 20 M.Sc. (H) students for their thesis/research as major supervisor. Have supervised 4 B.Sc. (H) students for their internship program/report. Have supervised more than 15 B.Sc. (H) students for their special problem/review papers.